SACRAMENTO, CA (MPG) - California State Parks, Sutter’s Fort State Historic Park (SHP) and Friends of Sutter’s Fort are proud to present an interactive, fun and festive “Hands on History: A Simple Emigrant Christmas” event on Saturday, December 8, 2018, from 10 a.m. to 5 p.m.
Fort visitors will be delighted to have the opportunity to step back in time to the 1850s to enjoy festive holiday traditions from early in California’s early history when people from around the world passed through the Fort gates, each with their own customs and traditions for the holiday season. 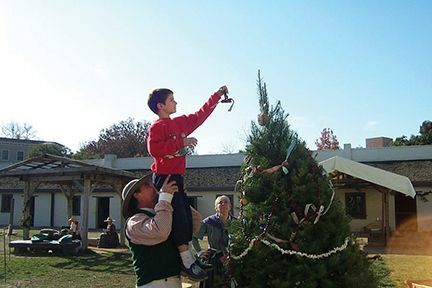 Friends and families are encouraged to visit the Fort to experience a variety of early holiday traditions and cultural activities similar to what early emigrants enjoyed. Complete with docents in period attire, entertaining vignettes will be set up that showcase a few of the diverse holiday scenes that will include food, music, decorations and other holiday traditions. As a special treat for kids of all ages, Father Christmas will be on-hand to hear holiday wishes. Fort visitors can also participate in a number of hands-on activities such as dipping and creating their own holiday candles, crafting their own “keepsake” holiday ornaments – that include snowflakes, cornhusk angels and bird nests – plus making holiday cards with nib (or “dip”) pens and colored ink, grinding raw wheat into “Christmas flour,” singing Christmas carols with Fort musicians and more. And, of course, popular demonstrations of black powder weaponry in action will take place including the crowd-favorite firing of the Fort’s cannon. Additionally, Friends of Sutter's Fort Trade Store will be open, providing complimentary samples of gold nugget chocolates and offering a special holiday sale.